38 (Irish) Infantry Brigade is titled. 38 (Irish) Brigade cross River Simeto, Sicily. 38 (Irish) Brigade assembles in North Africa. The Battle Honour CENTURIPE is emblazoned on the Queen's Colours of The Royal Irish Regiment. 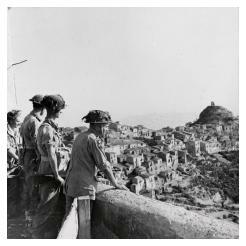 The German fighting in Sicily aimed to slow the Allied advance and not to defeat it, as escaping intact across the Strait of Messina to mainland Italy was the enemy's main objective. A vital German position to the west of Mt Etna, which controlled the road around the volcanic mountain, was Centuripe. The 78th Division assaulted the area but met stiff resistance from the Hermann Göring (Parachute Panzer) Division. Then 38 (Irish) Brigade was moved to Catenanuova, ready to capture Centuripe and its surrounding features. On 2 August, the 6th Battalion The Royal Inniskilling Fusiliers began their advance at 0530 hours and came under fire by 0845 hours. The 1st Battalion The Royal Irish Fusiliers moved at 0730 hours and came under fire at 0810 hours. The 2nd Battalion The London Irish Rifles was held in reserve to support the advance and, if necessary, seize key features on the left flank. It was mountainous country and the movement and fighting was in hot, dry conditions along mule tracks with companies carrying only light scales and hard rations. Water was in short supply and radio communications deteriorated at night. 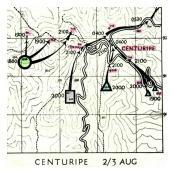 By 1230 hours, the Brigade Commander had made his plan to capture Centuripe by continuing to attack with 6 INNISKS on the right, 1 R Ir F in the centre and 2 LIR on the left flank in supporting positions west of the town. 2 LIR moved off at 1800 hours with full Divisional artillery support and overcoming light resistance occupied Points 611 and 704. Although H Coy were late on Point 703, the decision was made to continue with the attack in the centre by 1 R Ir F starting at 2000 hours. The Inniskillings, on the right and already in contact, had advanced two companies to the southern edge of the town through Point 708 (by the ‘impossible’* scaling of 100 foot cliffs) and around 1700 hours were meeting strong resistance in the town, including a tank. There followed a German counter attack and a period of confused night fighting for the Inniskillings, although they reported the town cleared of enemy at 0330 hours. However, the two Inniskilling companies on the right flank first captured Point 664, then Point 709, before finally entering Centuripe at 0630 hours the following morning. By first light on 3 August, the Faughs were on Pts 718, 685 and 700 having already fired green Verey lights at 0300 hours to signal capture of their objectives in the town. By 0630 hours the Faughs had consolidated their positions in Centuripe. General Montgomery is said to have exclaimed ‘Impossible!’ when he later saw the cliffs and reflected on the action by 6 INNISKS.